Oh so happy to know you! Yep..more Unity goodness! I'm a little addicted to it! This used the May KOTM, and colored the flower with Prismacolor pencils. Inked the edges of each layer of paper, added some crinkle ribbon, jute cord, and a button to finish. Happy Saturday! 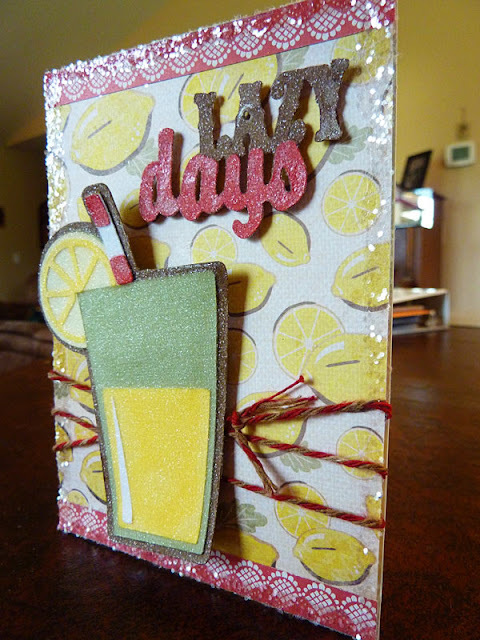 This card came out different than I saw in my head, but for once, I like it BETTER than what I was picturing! Don't you love it when that happens? Wish it would happen more, but that's okay - I'll take it when I can get it! 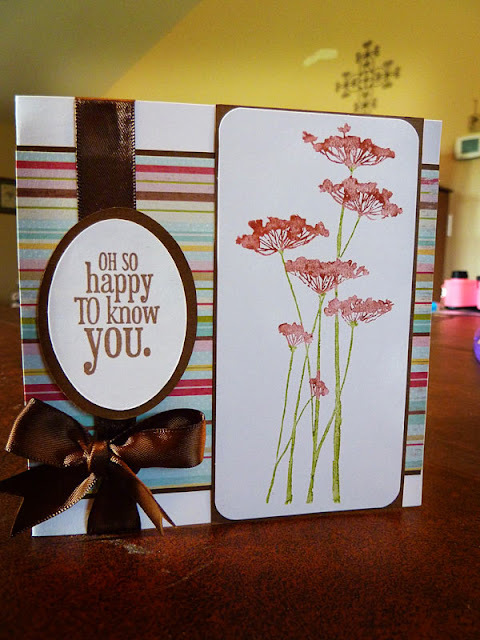 For this card, I started off by stamping the flower from Unity Stamp Co. in clear watermark ink, and heat embossing it with clear powder. I then sprayed it with a couple different shades of walnut ink, wiped off the embossed flower, and let it dry. The sentiment was stamped with black ink, and is from Scrappy Mom's stamps. Matted it in white paper, and attached it to the background paper. What's funny, is my husband in particular LOVED this card! He usually likes all my cards (wise man! ), but this one in particular he kept looking at and commenting on. Maybe it is just so different than the ones I have made in the past! Who knows! 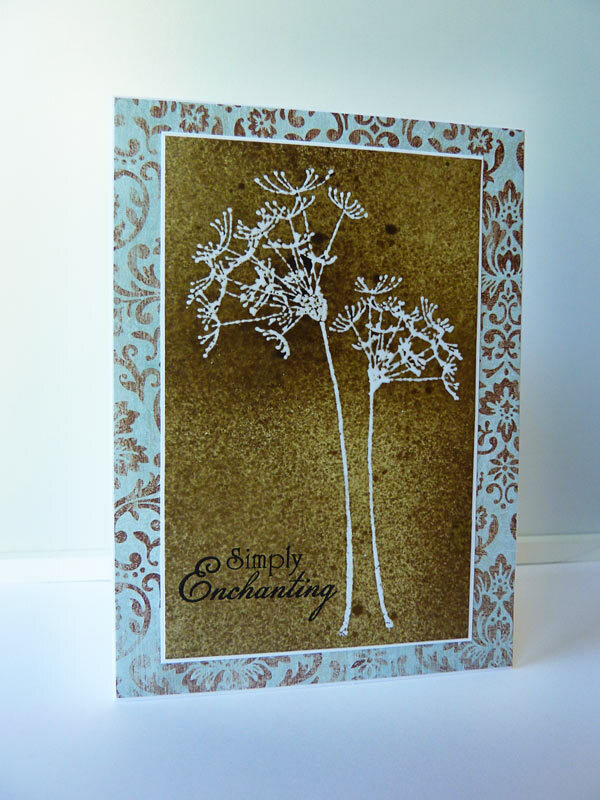 Thanks for stopping by - hope your day is "simply enchanting!" Good morning! Okay...I seriously had SOOO much fun with this card!!! Doesn't it just SPARKLE?!?!? 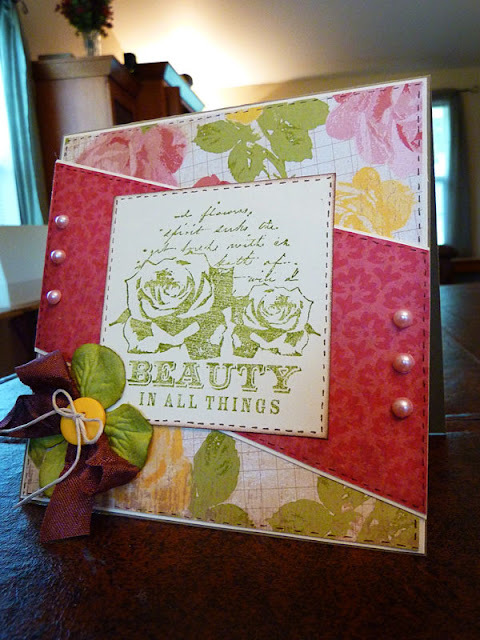 I used my one and only Market Street stamp (that is gonna change I think!) 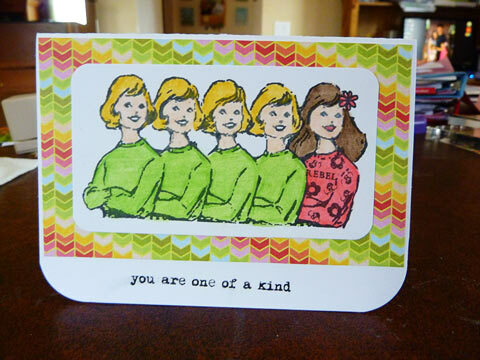 to stamp the background - which is awesome in and of itself, because it is large enough for an A2 card! 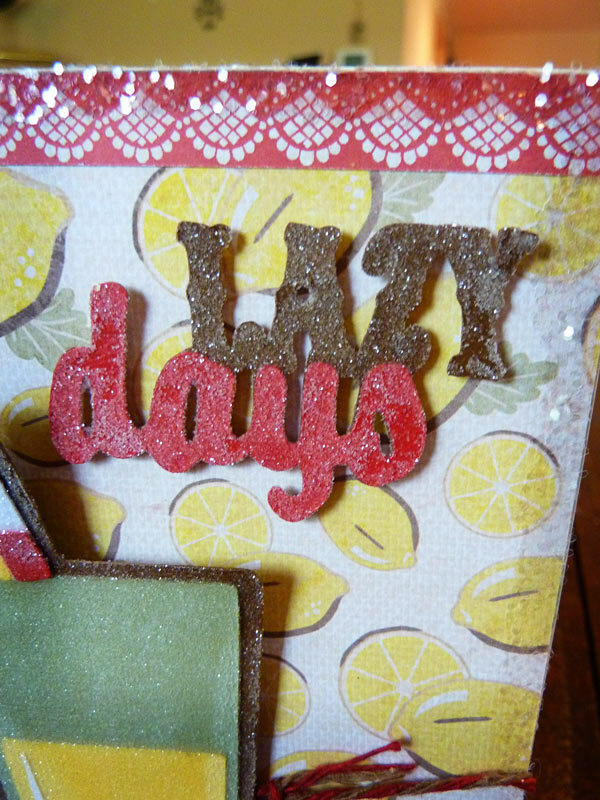 I then inked the edges, and added Glossy Accents and Martha Stewart course glitter. 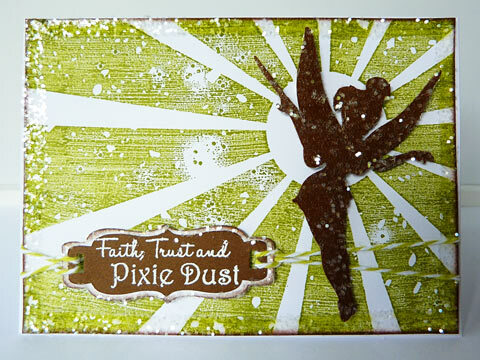 The Tinkerbell is cut with my Cricut using Disney Tinkerbell and friends, and again, covered with Glossy Accents and glitter. 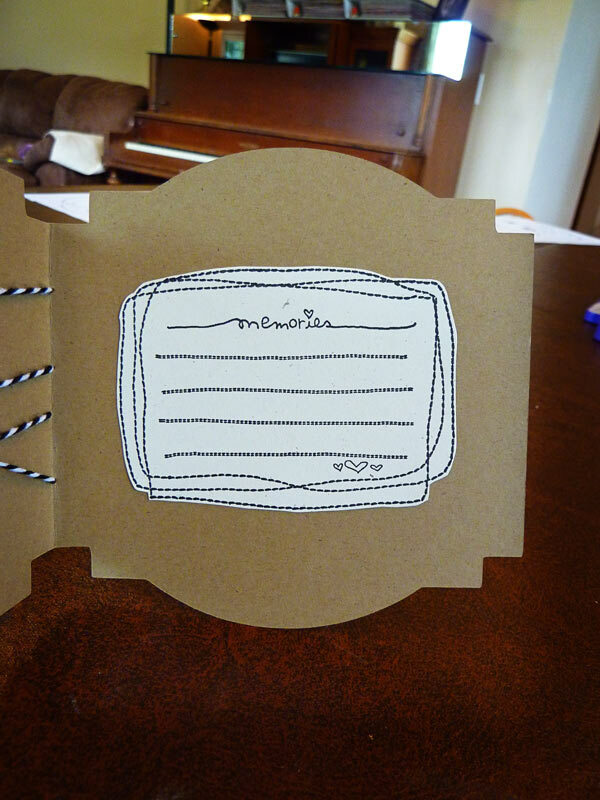 The sentiment frame was cut from Once Upon a Princess, inked and glittered as well, and stamped with a sentiment from Scrappy Mom's stamps heat embossed in white. Tied it on with some Baker's Twine, and pop-dotted Tinkerbell and the sentiment. Have a magical day!!! 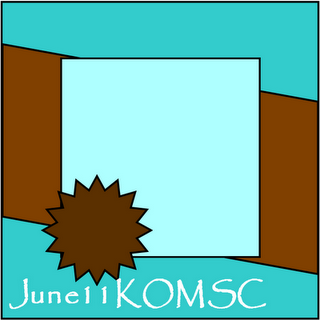 Unity Summer Challenge - Smile it suits you! 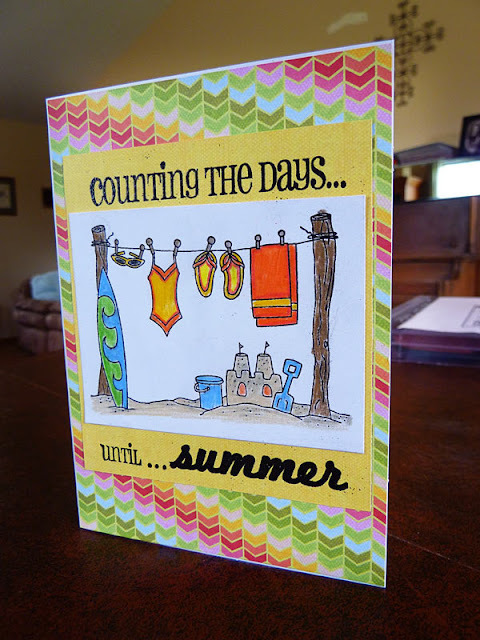 I already made one - but couldn't resist making another card for the Summer Fun challenge over at Unity Stamps! I hadn't inked up this image yet, so it seemed like the perfect opportunity! I stamped it on kraft paper, paper pieced it with the background paper, and added a little bling in the center of the flower using my Jolee's heat set tool. 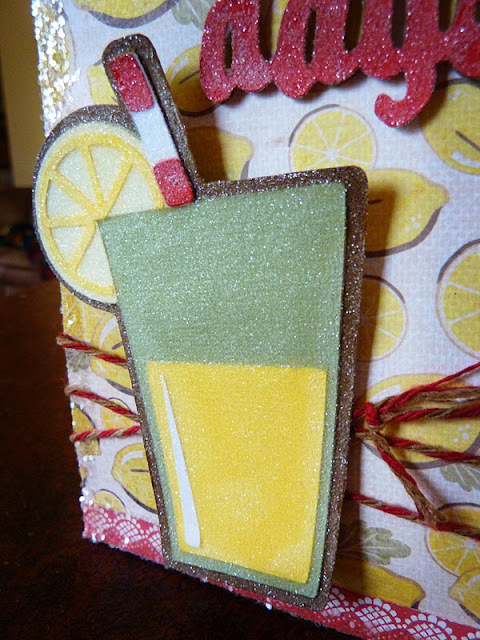 To finish, I used an edge punch on a little extra kraft paper and added some velvet ribbon and pom-pom ribbon. 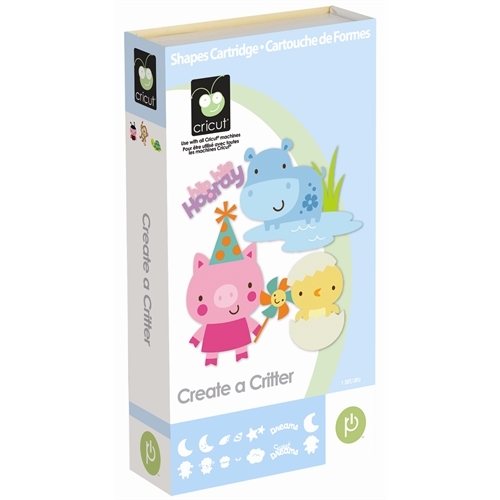 Cricut 360 - Giveaway Alert!!! This is SERIOUSLY one of my all time FAVORITE cartridges!!! Here is what you need to do to have a chance to WIN!!! link that post with in-links so we can see it. Winner will be chosen using Random.org and announced Thursday, June 30th - so make sure and come back to check and see if you WON!!! Click HERE to come join the fun - we are going to have a BLAST!!! Look forward to seeing you there!!! Good morning - and HAPPY FRIDAY!!! Welcome to another Friends with Flair post! I am also submitting this to the Unity Kit of the Month sketch challenge. The sketch we were supposed to follow is at the bottom. I used the June KOTM - such a great set this time around! Followed the sketch pretty much exactly, just added the pink pearls along the side. Did some faux stitching with a brown pen, and added a Prima flower, a bit of crinkle ribbon, and a button with some jute cord. Now...don't forget to leave a comment, and hop on over to the Unity blog to join in and get a chance at winning some FABULOUS red rubber!!! 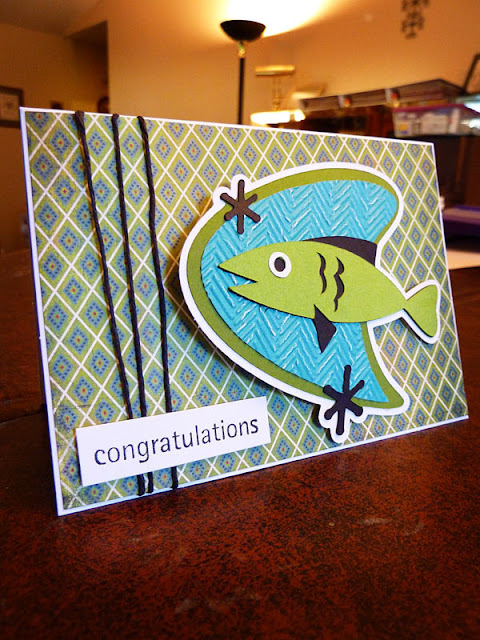 Got a busy day today - so I just thought I would quickly share this little card that I hadn't gotten around to posting. You ever have one of those projects that you don't really care for that much when you are finished...but you can't think of anything else to do to fix them? This was one of those for me...oh well! Can't win them all! I think it just didn't come out like I was picturing in my head. I used some Unity Stamps for the stars and sentiment. 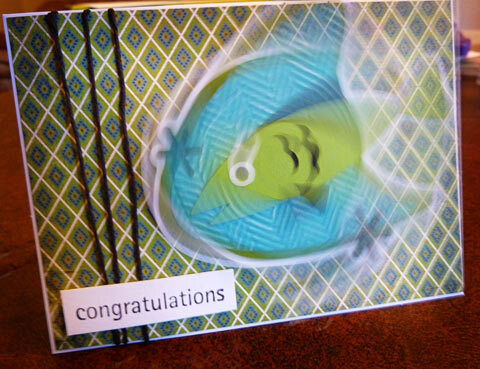 For the card, I rounded the edges off of two pieces of cardstock, scored the front piece, and attached them with brads. 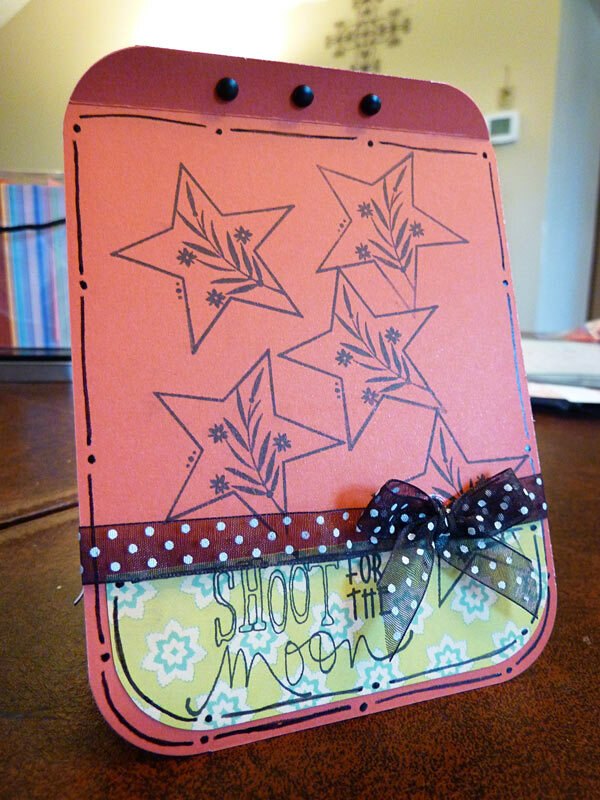 Added some patterned paper, some doodling, and a bit of sheer ribbon. Good morning! This was actually my first attempt at using odorless mineral spirits to blend colored pencils. 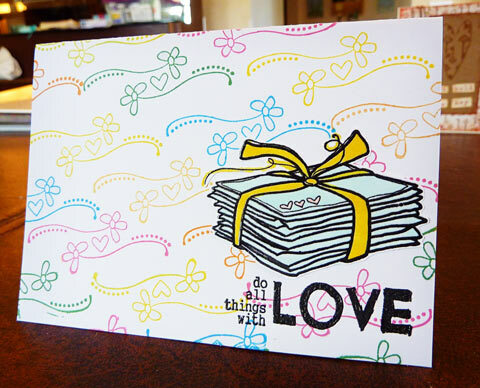 I couldn't wait to ink up this image from Unity Stamp Co, and I had a friend that I wanted to give a special card to. She needed a little cheering up, and something to say how special she is. I colored these fabulous gals in with my Prismacolor pencils, used odorless mineral spirits and a Q-tip to blend them, stamped the sentiment (that was actually attached to the glasses! ), rounded off the edges in a couple of spots, and it was PERFECT! I just couldn't resist doing another card for the Gallery Idol contest. 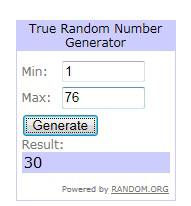 There are now over 800 entries, so I'm not holding my breath, but it is still fun to join in! The other day I purchased some felt from Michael's, thinking it would be fun to try it out on some cards. I started playing with it, and cut out some banners. The colors ended up going together just right with some paper I had picked up last week as well - brand new from Basic Grey - isn't it adorable!?!?!? I did some machine stitching around the edges of the card, and to attach the banners, cut the words out using my Cricut and Boys Will Be Boys cartridge, and added some Glossy Accents to them. I didn't want to risk showing these too soon, so I thought I would quickly post these here a day late! The first card is the one I made for my Hubby for Father's Day. I used some Ippity stamps by Unity Stamp Co, cut out the banners, and used the stamp shape and letters from the June KOTM. Finished off with some machine stitching. The next two cards were for my Dad, and my Father-in-law. I stamped several different sentiments from My Creative Time's set called "You're my Best Buddy". Stuck that on the patterned paper, punched some holes and threaded some Jute cord around with a button, rounded a couple of edges with a corner rounder, and just that quickly, I was done! Hope everyone had a special and meaningful Father's Day! It seems I have seen people talk about using odorless mineral spirits to blend colored pencils a lot lately, so I finally caved and decided to give it a try. I was pleasantly surprised to find it at Michael's last week, and to discover it was really inexpensive (especially with a coupon!). So I pulled out a Unity Stamp image, colored it with my Prismacolor Pencils, and just used a Q-tip dipped in the mineral spirits to blend it. Worked like a charm! I couldn't believe how much neater it made the image look! And a lot cheaper than buying Copic markers! I kept this card pretty simple, and added a sentiment from My Creative Time stamps to finish it - which I must say fit PERFECTLY with that stamped image! 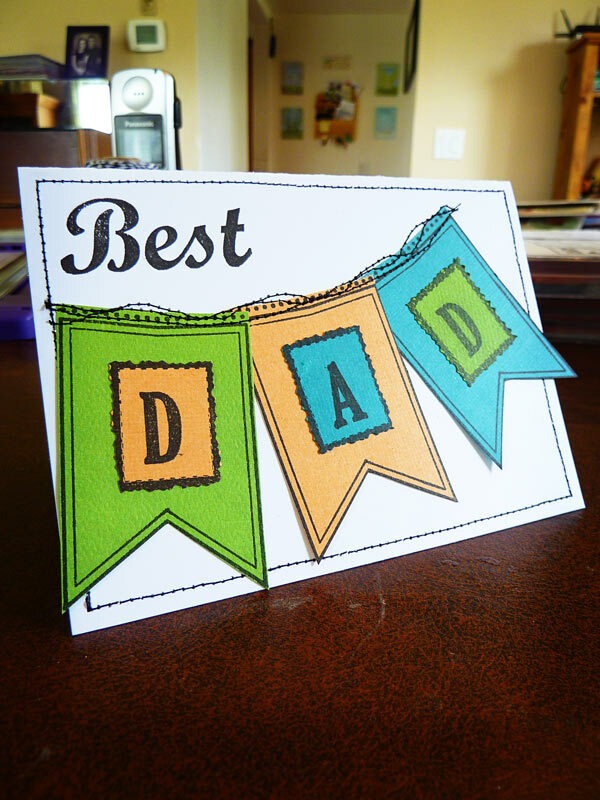 Tomorrow I'll show you the card I made for my hubby for Father's Day! I don't want to risk him getting on here and seeing it before then! 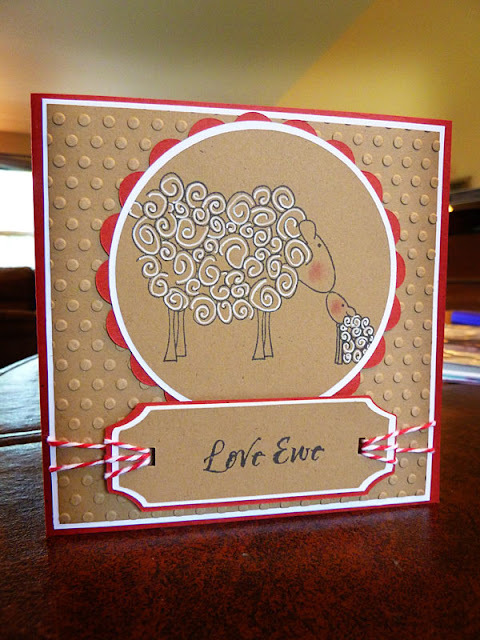 Unity Friends with Flair - Love Ewe! It's Friday, so welcome to another Unity Friends with Flair﻿. Click on the link to go read all about it, and for a chance to win some fabulous prizes!!! 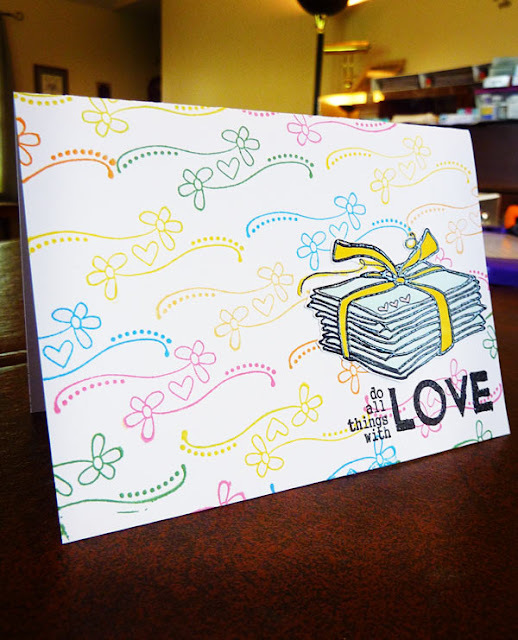 Yesterday marked one year to the day since my Grandma passed away, so I made this card a couple of days ago to send to my mom so it arrived to let her know I was thinking of her and love her. My mom has always collected sheep, so this image is perfect for her! I love these little sheep! I stamped the ink, then used my white gel pen to doole on the wool, and added some ink on the cheeks. The scallop and circles were cut from Elegant edges with my Cricut. The tag shape was cut from Gypsy Wanderings. Ran the background was run through my Cuttlebug, and the tag is tied on with Baker's Twine. Thanks for visiting!!! 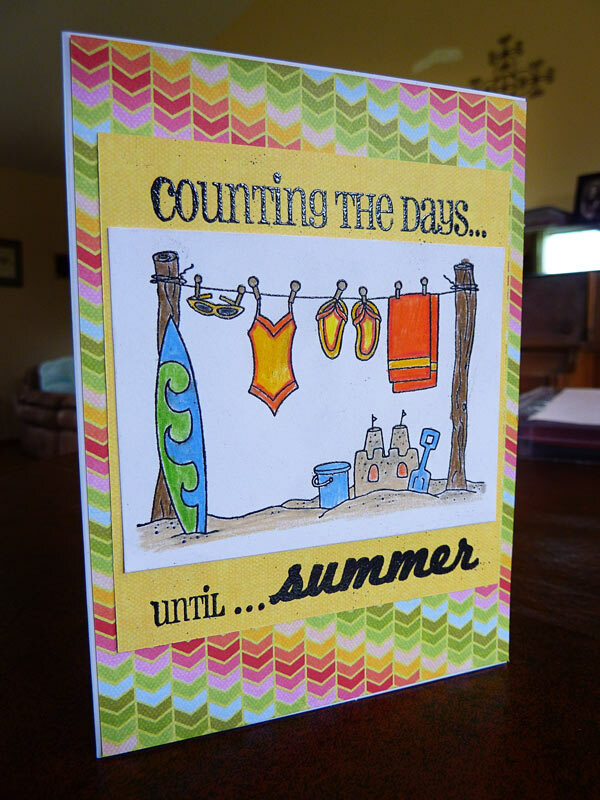 So...there is a new challenge over at the Unity Stamp Company Challenge Blog: Sun & Fun! Since I had just received the June KOTM, this image just seemed PERFECT to submit to that!!! I colored in the image with my Prismacolor pencils, and heat embossed the sentiment. The second picture shows how shiny the embossing is! And I don't know about you - but I AM counting the days until summer! Or at least until it truly feels like summer!!! Have your cake...and eat it too! 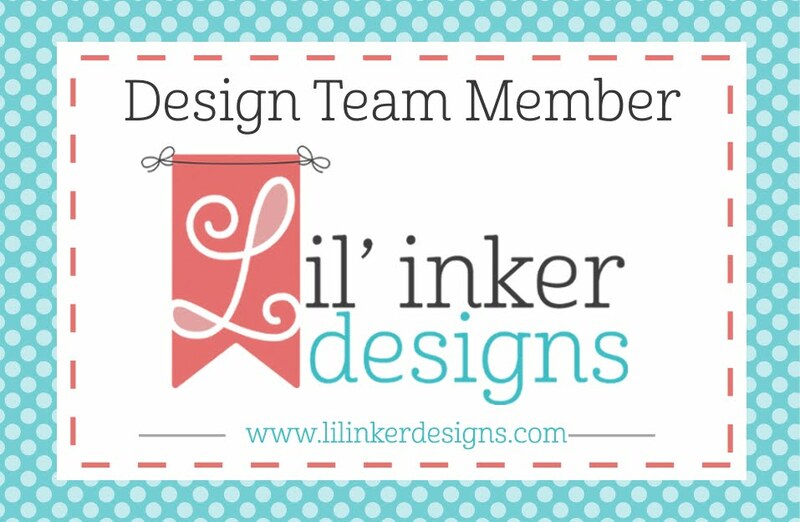 I love this little cupcake from the newest Unity Kit of the Month for June! I was so surprised to get my kit at the end of last week! I normally didn't get it until the very end of the month, but just switched to paying by credit card instead of paypal. It would seem that makes all the difference! Either way, I was very happy and surprised to receive it already!!! Anyway - back to the cupcake! It has such a nifty, retro look I think! 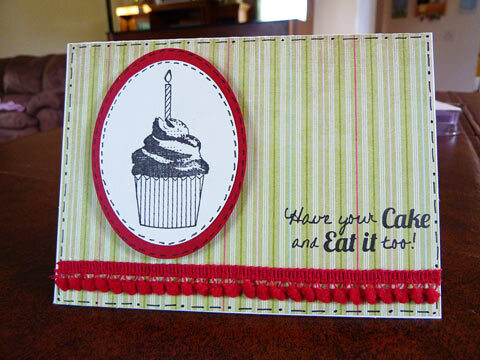 So I paired it with some soft stripes, a little pop of red in the oval and pom-pom ribbon, some doodling, and a sentiment from Scrappy Mom's stamps. Enjoy! 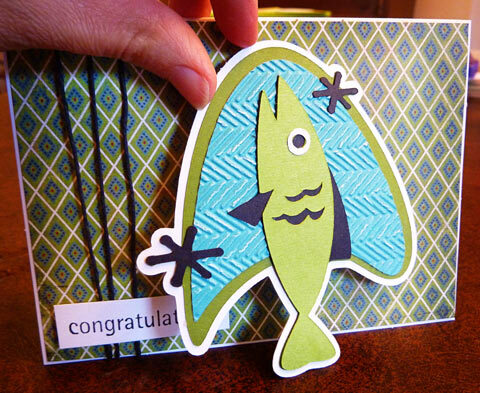 I had a request a while back to make a graduation congrats card for a high school graduate - and to use a fish on it. Can you tell he kind of likes fishing? Anyway, this is what I came up with! I used Nifty Fifties for the fish and his background, ran one layer through the Cuttlebug, and popped him on an action wobble. Isn't he fun?!?!? Added some Jute cord, and a sentiment from one of my Unity Stamp sets. Thanks for stopping by!!! 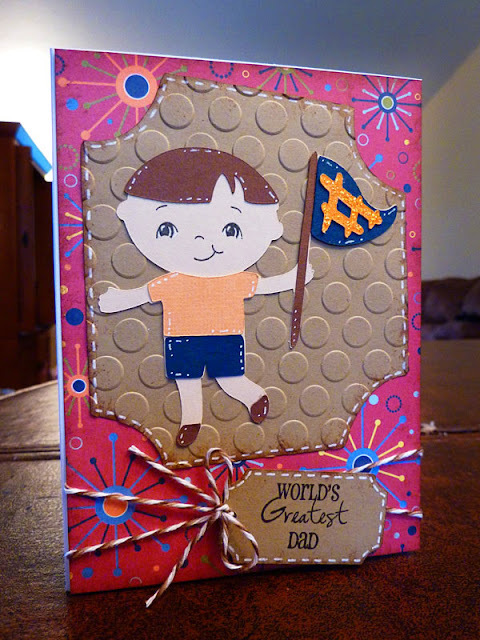 Father's Day Card - World's Greatest Dad! Good morning! 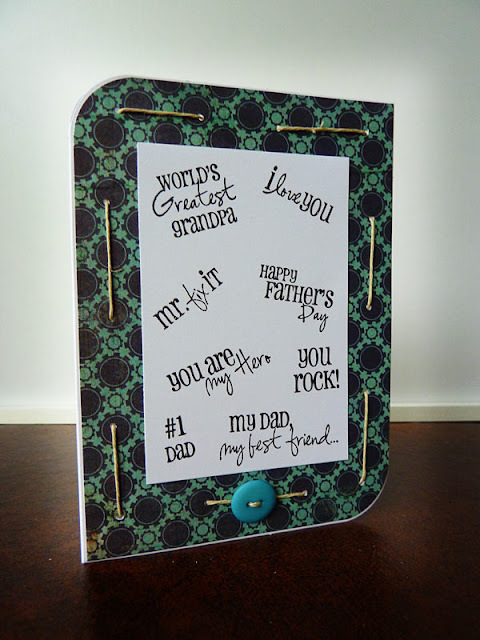 Today I have another Father's Day card - this time one I made for the Throwback Thursdays Challenge at My Creative Time. The Challenge was to use a Lite Cartridge and some "bling" somewhere on the project. 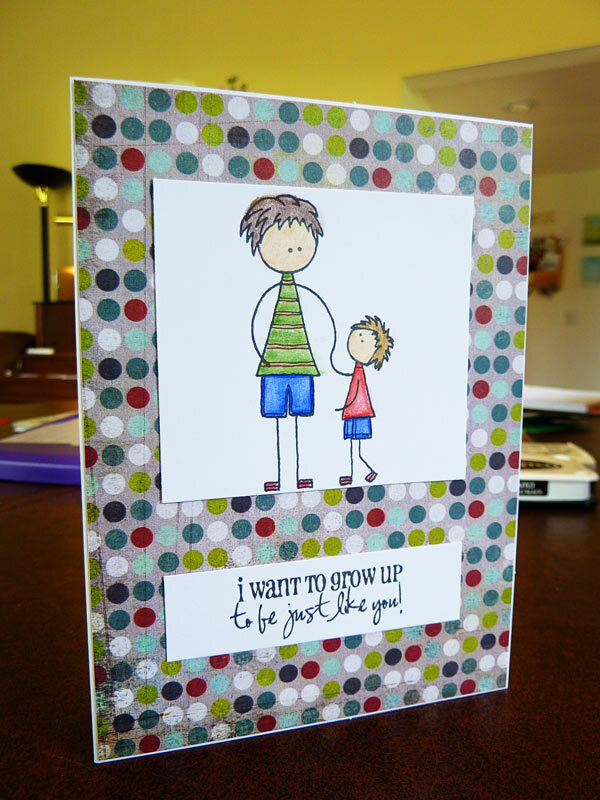 For this card, I used Playtime Lite cartridge for the little boy, and the background frame. I inked the edges of the frame, added some white stitching, and ran it through my Cuttlebug. The "bling" that I used was some Stickles on the flag. The tag is cut from Gypsy Wanderings (I think! ), and the sentiment is from Emma's stamp set called You're My Best Buddy. Finished off with a bit of extra doodling, a Peachy Keen Face, and some Baker's Twine. Graduation Day for my Hubby!!! 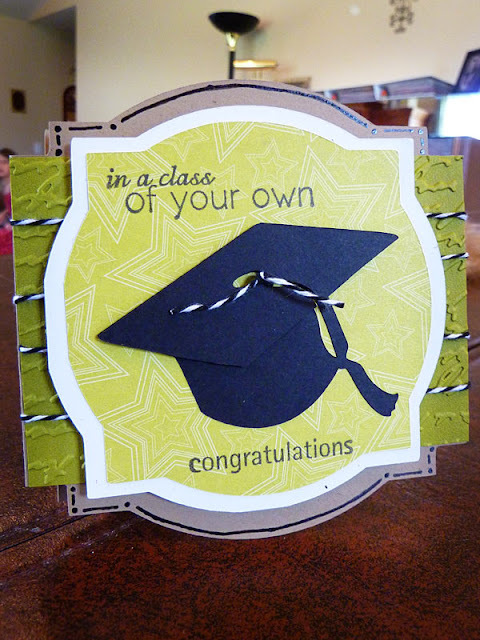 I used Elegant Edges for the card shape and frames, and the graduation cap is cut from A Childs Year. I cut it out twice, then hand cut off just the top and pop-dotted it on for some dimension. The picture doesn't show that too well unfortunately! 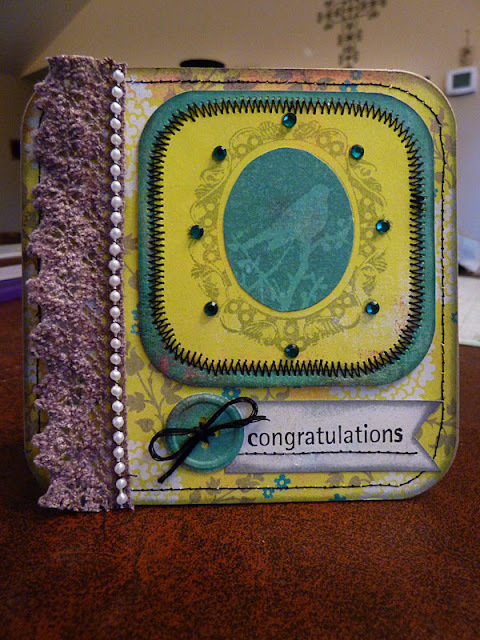 Added a sentiment from Unity Stamps January KOTM, some Baker's Twine, and a bit of doodling. For the inside, I stamped and cut out an image, also from the January KOTM. Thanks for looking!!! 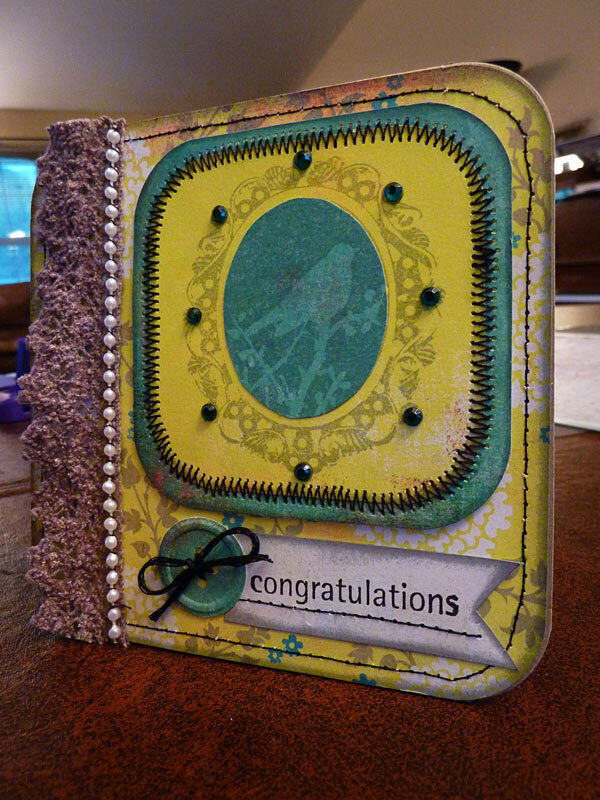 I am also entering this is the Graduation Challenge over at Scrapbookaholic by Abby. Whew!!! Are you ready for a card that meets the requirements for a lot of challenges?!?! 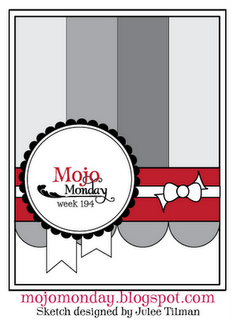 The first challenge is a sketch challenge over at Mojo Monday's - isn't it a great sketch? 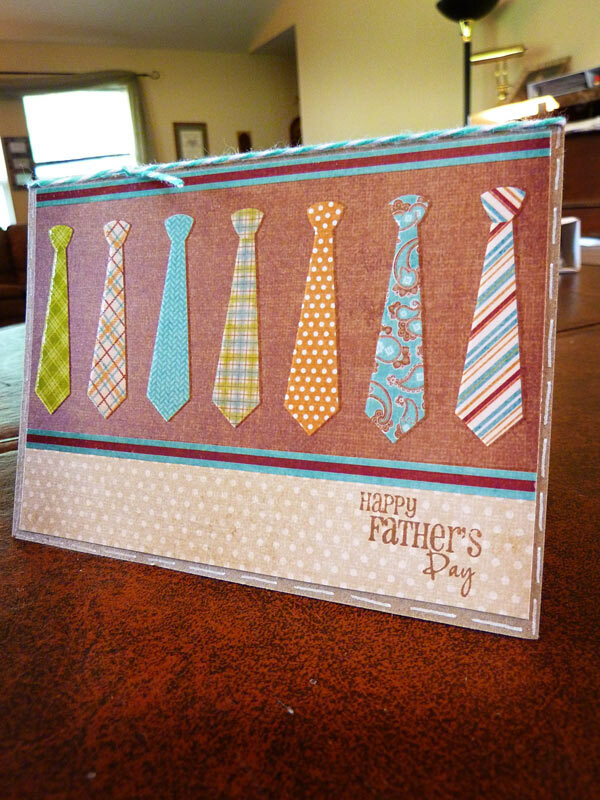 The next challenge is over at Whimsical Wednesdays - Father's Day Card of Project. 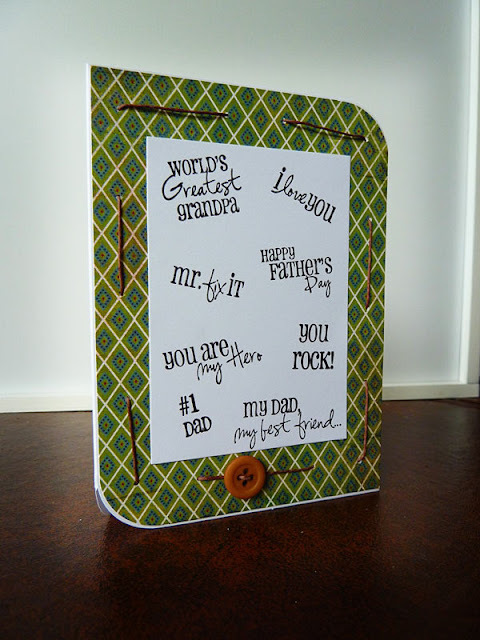 Then we have the #1 Dad Challenge over at Fantabulous Cricut. 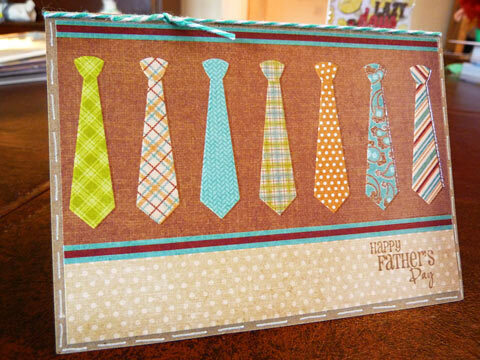 Also linking this to the Father's Day Challenge over at the Creative Cutter Room. Finally, the challenge over at My Craft Spot - Tie It On - use ribbon or twine on your project. 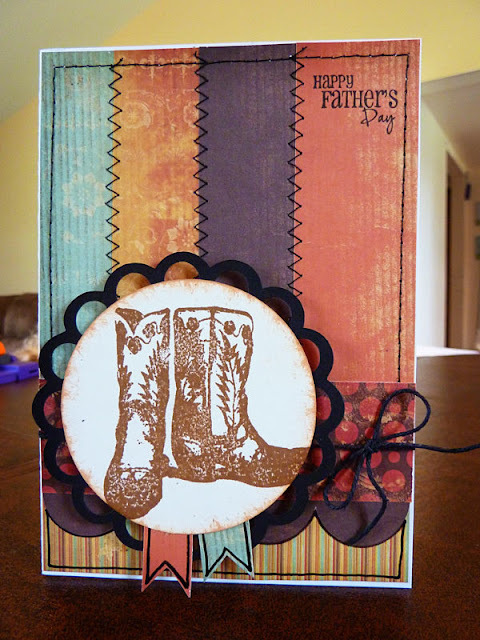 For this card, I used another one of my new Unity sets from the sale last weekend - Brave Girl Boots (shhh...don't tell that the name says girl and it's a Father's Day card!). The circle and scallop frame are cut with my Cricut using Elegant Edges cartridge and inked a little with some Tim Holtz distress ink. The scallop edge on the bottom is also cut from that cartrtidge. I did some machine stitching, a little doodling, hand cut the two banners at the bottom, and tied on a bit of black jute cord. 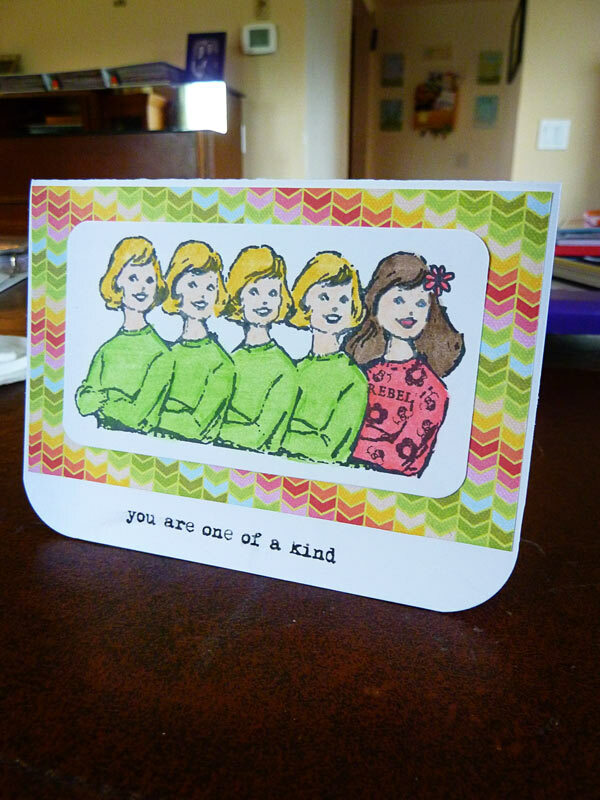 Finished off with a sentiment from Emma's stamp set called You're My Best Buddy. And...as a grand finale - I am also linking this with the Thursday Patches of Pink Link up Party! Friends with Flair - Oh So Happy! Hello - and welcome to this weeks Friends with Flair! Check out the Unity blog for all the info and to win a BUNCH of awesome stamps!!! I got my order yesterday from the fabulous warehouse sale that Unity Stamps had last week, and as I organized and put them all away, this image just called out my name! I had some new American Crafts Stamp Markers that I was dying to try, so I pulled them out as well! I colored the image with two different colors, stamped on white cardstock, rounded the edges, and matted it on brown paper. The sentiment came from the May KOTM. Finished off with a bit of brown ribbon for a bow. Just had to share a couple pictures of my BEAUTIFUL daughter!!! Yesterday was her 8th birthday (how the time FLIES!!!). 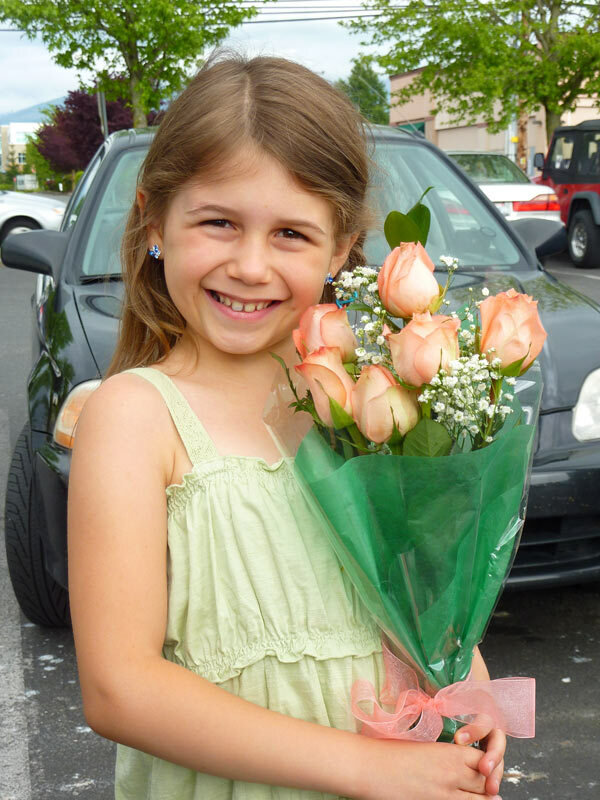 Daddy always brings them flowers on their birthday - such a sweet tradition! 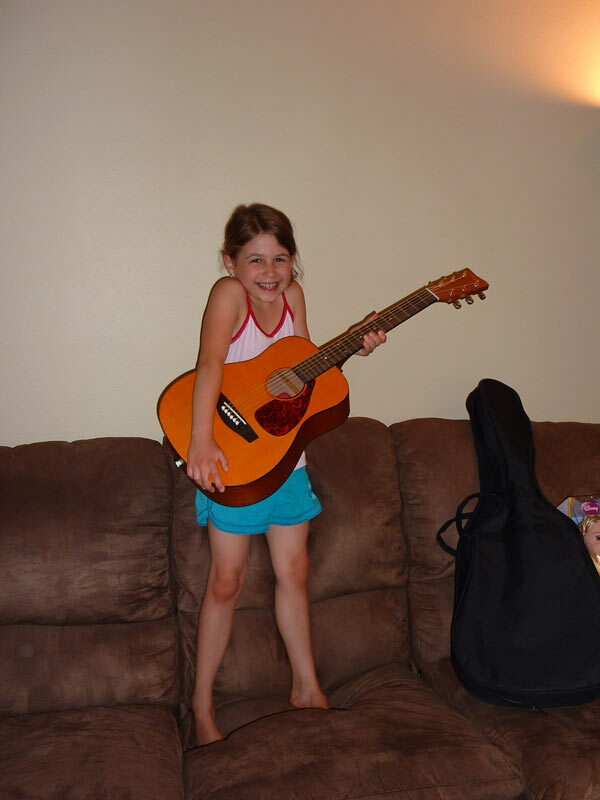 And we got her her first guitar - she has wanted one for a while now! The pic below is AFTER she jumped up and down in excitement!!! 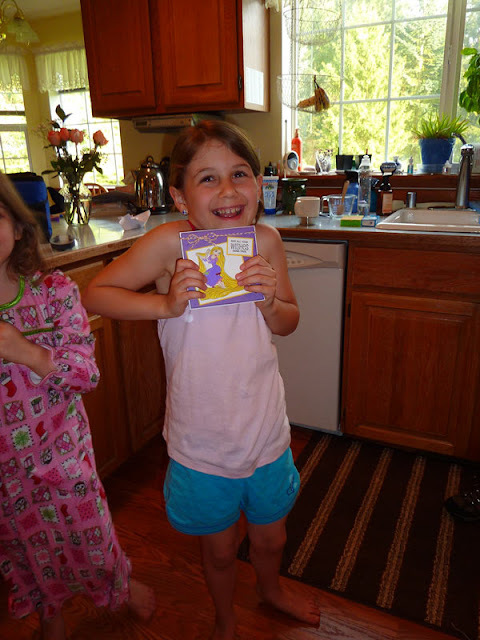 And she loved her "Tangled" card! Happy Birthday dear sweet Katie!!! Good morning! Posting a super simple and quick card this morning - got a busy couple of days ahead of me! My husband GRADUATES this Saturday...after 8 years of being in college, having a more than full time job, and having a family! 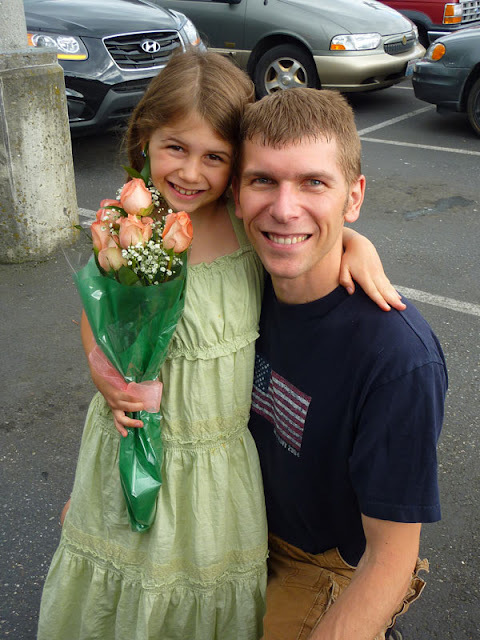 He started when our firstborn was only 2 months old, and yesterday was her 8th birthday, so our two daughters have never known a Daddy that wasn't in school and studying in his spare time!!! We are all so excited!!! And I am doing an open house in his honor on Sunday...I have SOOOO much to do!!! 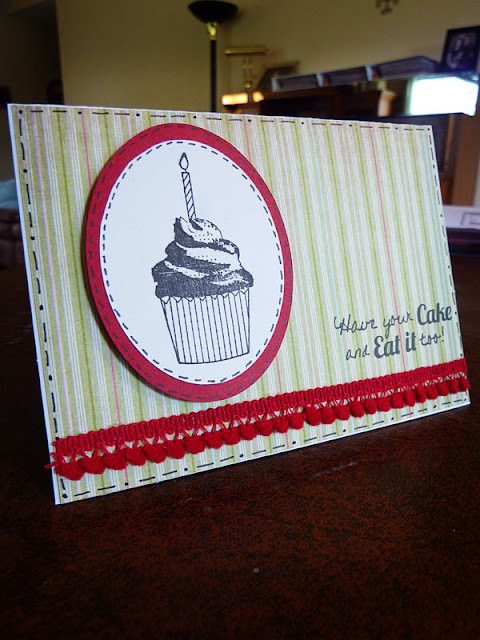 This card was one of the most simple and quick cards I have ever made! Used the DCWV Guy stack, added a sentiment from Emma's My Creative Time stamps, a bit of Baker's Twine, and a little doodling with my gel pen. That's it!!! 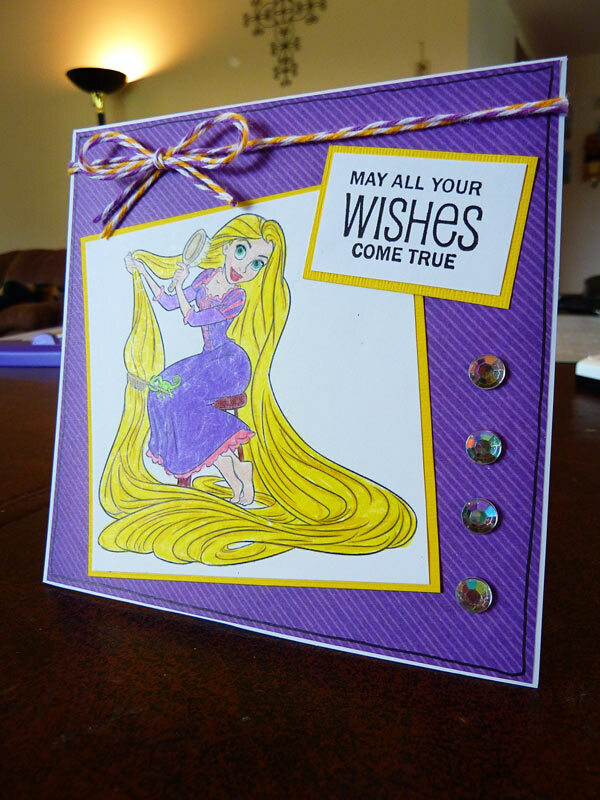 Just a quick post today to share the birthday card I made for my daughter's 8th birthday today (who thinks its funny to tell me that now that she will be 8, she is halfway to driving!!! Eeek!!!)!!! She wanted a "Tangled" birthday, and since I didn't have anything for that, I had to get creative! I looked online and found some printable coloring pages...shrunk them down, colored with my Prismacolor Pencils, added a stamped sentiment, some Baker's Twine, and a bit of bling, and voila! 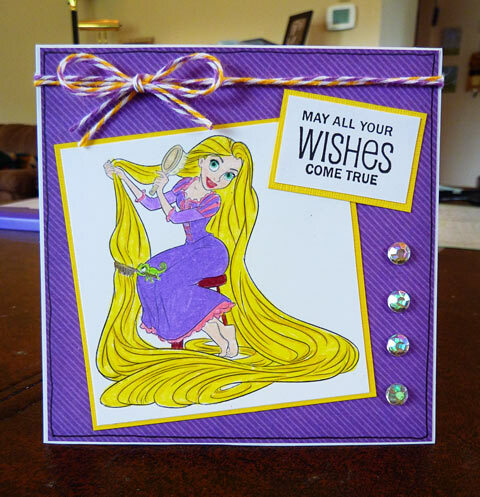 Tangled birthday card!!! Can't wait to see her face when she sees it! Happy Birthday my sweet Katie girl!!! Lately, I have felt like I have been struggling to be creative, but last night I let out all the stops and just had fun! I LOVED making this card - it just all came together and was a joy to make. Don't you love when that happens? 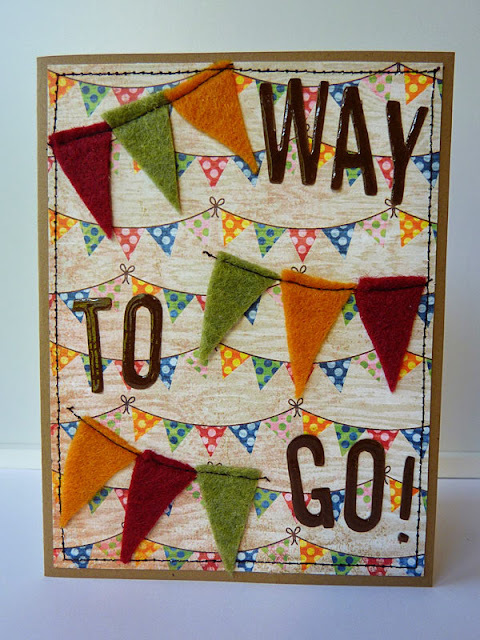 I wanted to make a "congratulations" card to enter in the Gallery Idol Season Five competition - you can click on the link to read more about it. 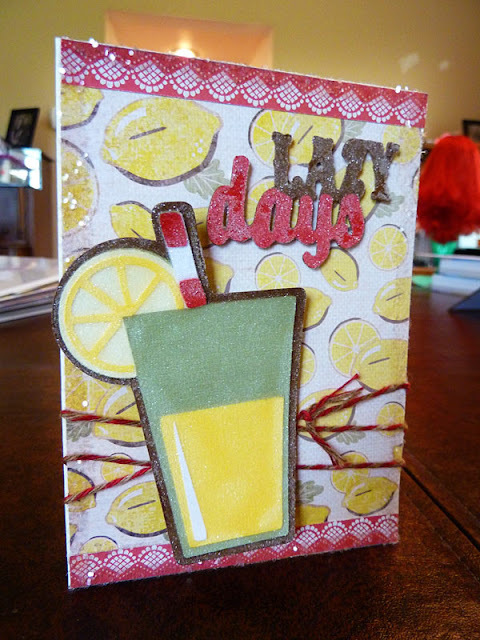 Basically, it is the "American Idol" of cardmaking! I know the odds of being one of the 20 finalists out what will most likely be hundreds of entries is pretty slim, but I still couldn't resist joining in on the fun! I used Unity Stamps for this card - the bird image is from the new May 2010 KOTM, and the sentiment is from the January 2011 KOTM. I did a little paper piecing on the bird image and added some bling with my Jolee's heat set tool. Did a bunch of machine stitching and inking as well. Added some velvety lace and pearls that I hand stitched together, and finished with a button that I punched with my Martha Stewart button punch and tied with a bit of black floss. More Unity Goodness AND Grillin' and Chillin' Blog Hop WINNER!!! Congrats Shelly!!! I will send you an email right away so I can get this in the mail to you! I wanted to quickly share a card I made the other day for the bi-weekly challenge over at My Unity Place. This week the challenge is to Make Your Own Background, using stamps! I used the May KOTM for all the images on this card. 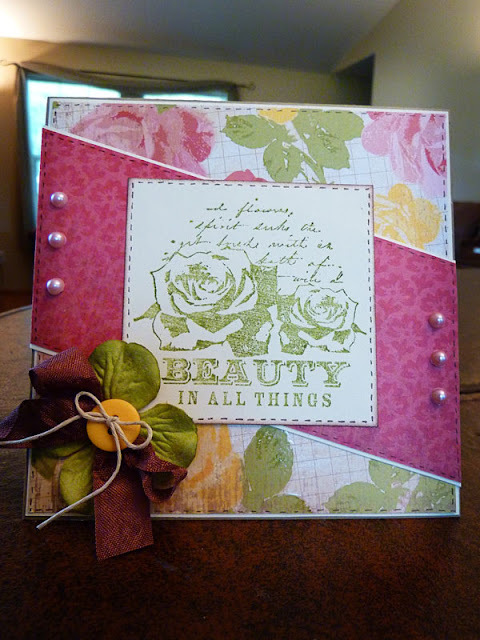 I stamped the cute little flower flourish in several different colored inks for the background. I then stamped the stack of letters on plain white paper, heat embossed it, colored it with Copics, then cut it out and glued it on my "background" paper. The sentiment I stamped directly on the patterned paper I made, then heat embossed it as well. Have I mentioned lately that I LOVE Unity stamps?!?!?!? Welcome to BugBites first ever Bug Hop - Grillin' and Chillin' Bug Hop!!! To celebrate the beginning of summer, Barb over at BugBites is hosting two consecutive weekends of Bug Hops. This week it's all about the Chillin' - June 4-6. If you've come from visiting Priscilla, you're in the right place! If you are just a regular visitor to my blog, and would like to play along with our Grillin' and Chillin' Bug Hop, click HERE to start from the beginning! The entire line-up is posted at the end of my project, in case you get lost along the way! Each designer along the bug trail is featuring a project based on the Grillin' and Chillin' theme. What's more exciting, is that you can participate too by creating a project and linking it up over at BugBites for a chance to win a BIG prize!!! But there's a twist. Your project must include at least one Cricut cut, and at least one of the critters that have been hidden within some of the bug stop blogs. Be sure and visit all the bug stops to find all your critter choices. 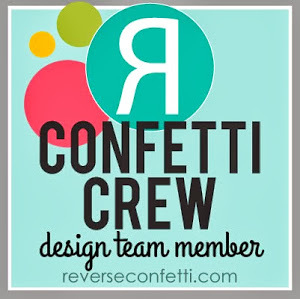 While you're looking for critters, be sure to check out the blog candy that each designer has to offer you! You don't want to miss out on any of it! The glass of lemonade and the sentiment were cut from the cartridge Just Because Cards. 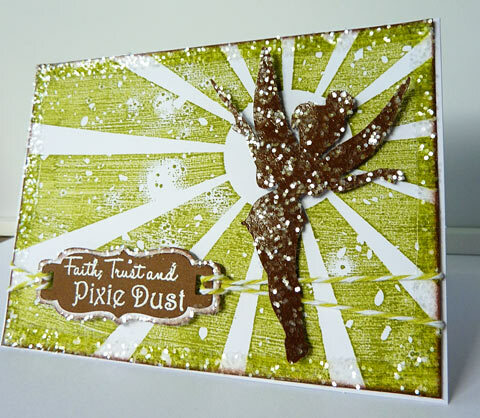 I covered the assembled images with Glossy Accents, and coated them with fine glitter to give them a "frosty" effect. For the Baker's twine, I needed it to look a little more vintage, so I rubbed it around on one of my Tim Holtz distress ink pads and let it dry before tying it around and putting a simple knot in it. 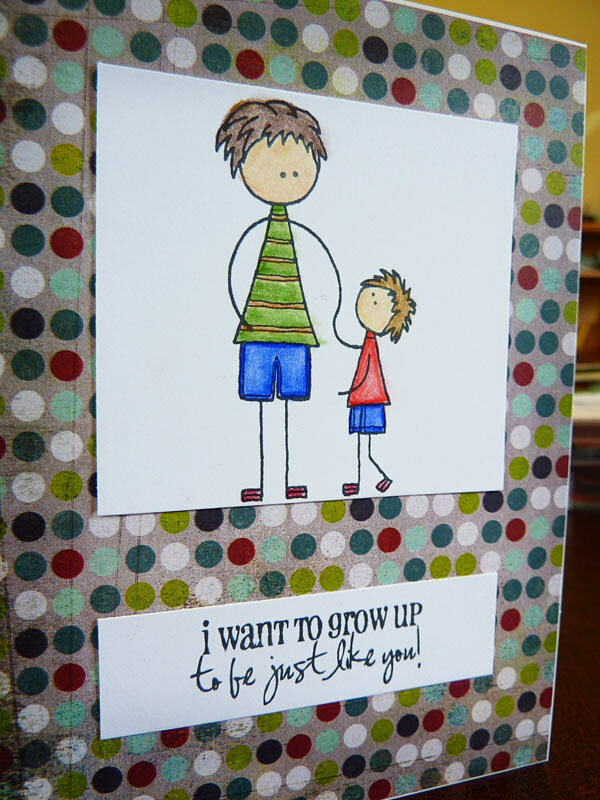 The image and sentiment are both pop-dotted from the background to give it some great texture! And to finish it off and make it really sparkle, I put some Glossy Accents around the outside edges of the card, and covered that with some Martha Stewart coarse and chunky glitter...I LOVE the extra sparkle! 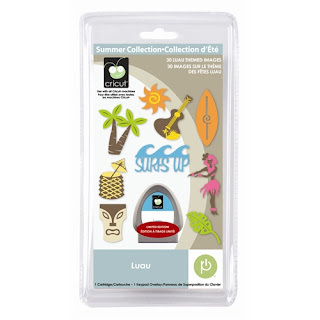 ...LUAU!!! Just leave a comment and a way for me to reach you if you win!!! Here is the entire blog line-up, in case you get lost along the way! 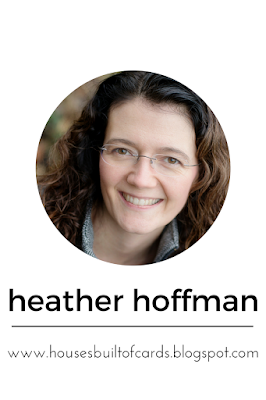 Heather - You are HERE! Theresa - This is your next stop! Unity FWF - Sending Some Happy!!! Patches of Pink Design Team - Father's Day Frog!